The deep-sea encompasses great volumes of Earth's oceans. This is the area above the continental slope, abyssal plain, ocean ridge/rise system, and trench systems. Most of this area is cold, dark and with exceptionally high pressures. The lessons on the deep-sea benthos and deep-sea water column will cover this part of the deep-sea. 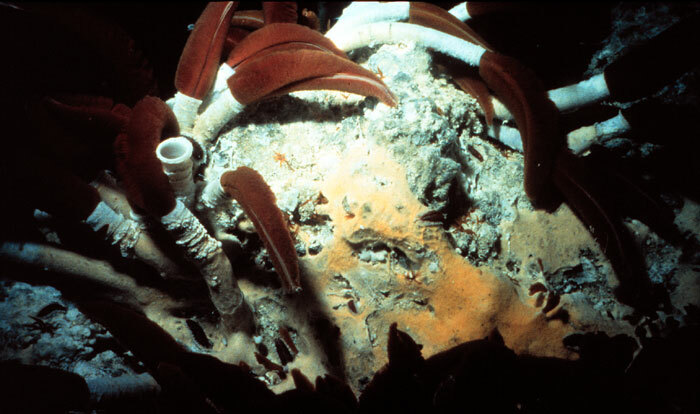 But, there are unique areas where volcanism has made this deep-sea area very hot and these vent communities are quite different than the other areas. Many bizarre species live in all of these areas, each with interesting life stories. These lessons will cover just a few of the deep-sea species - new ones are being discovered all the time.